If you have friends, lovers, colleagues or family members who enjoy wine, beer, cocktails and the like, I've scoured the stores and the information super highway to find cool, fun—sometimes even useful—gifts for your favorite libation lover. They called it "liquid liberation"; I call it a terrific way to give your favorite cocktail a facelift. Sugar House Libations (801-747-9032) makes fruit-infused simple syrups ($18) for upscaling cocktails using fruits, herbs and aromatics such as lavender, ginger, lemon grass, pear, raspberry, plum and others. Find these sweet mixers at the Winter Market in the Rio Grande Depot, at Mod a-go-go (Salt Lake City, 801-355-3334, Modagogo.com), and at SugarHouseLibations.com. New Year's Eve is just around the corner and you'd like to make an impact when the clock strikes midnight, right? I've got just the thing to shock and awe your party guests. It's the French-made Laguiole en Aubrac Horn Champagne Sabre ($313) at US.Amara.com. Each sabre requires more than 100 production steps and is created by hand by a single craftsman. Or, for something a little less flashy and dangerous—not to mention a lot less coin—you can get a high-quality classic Laguiole Corkscrew with bamboo handle for $40 at Food52.com. If you're looking for a nifty wine tote bag to give as a holiday gift, or just to schlep wine to your next party, consider the Save the Wino tote bag ($14.99). It's available at Whole Foods stores and at LifeLineFashion.org, and the bags are intended to help raise consciousness about the ivory trade in Kenya by supporting rhino conservation with the Ol Pejeta Conservancy; $1 from each bag is donated to the Conservancy. Other ways to make your wine dollars do good is by purchasing wines that support important causes. For example, Rodney Strong Vineyards has donated more than $200,000 to the United Way and to food banks across the country with proceeds from sales of Rodney Strong Cabernet Sauvignon, Sonoma County ($20). Likewise, Murphy-Goode Homefront Red ($14) was created to benefit Operation Homefront, an organization providing assistance to the families of service members and wounded veterans. Fifty cents from the sale of each bottle sold goes to help military families in need. For some reason, I hate to part with my wine corks. But I have way too many trivets made from corks already. So, I was thrilled to discover a new use for my used wine corks: Turn them into art! That's easy to do with the Metrokane Store (Metrokane.com) Rabbit CorkHaus ($30). It's made from stainless steel and bamboo and sort of looks like a spice rack, except that it allows you to display your personal cork collection. The next time you're toting a six-pack of your favorite brew, why not do it with a personalized wooden beer holder ($49)? It's a handsome, antique-looking wooden six-pack holder with your name embossed on it: "Scheffler's Brew," for example. 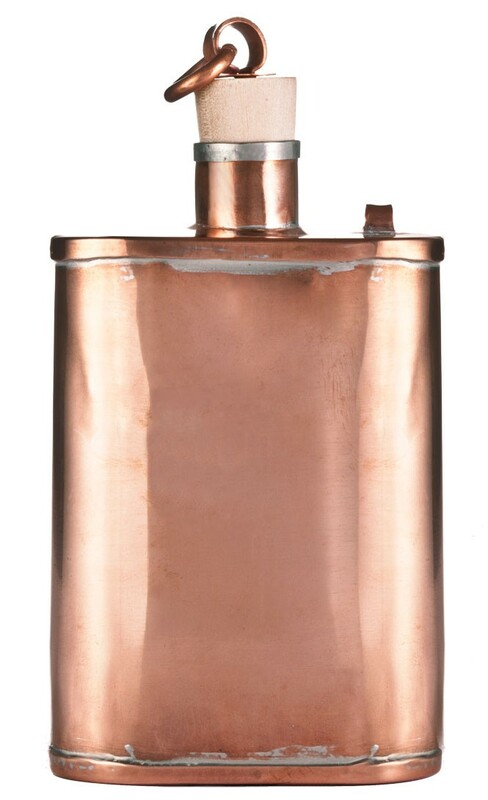 Find it at Gifts.com, which also sells the beautiful copper handcrafted Jacob Bromwell Great American Flask with wooden gift box ($149.99). Beer lovers and table-sports enthusiasts will also get a kick out of the Mini Beer Pong set ($75) from UncommonGoods.com. You don't want to have "tannin teeth" or "Malbec mouth" marring your perfect smile during the holidays, do you? Then here's a solution from the girls at Borracha: Wine Wipes ($6.95 for a pack of 12, WineWipes.com). One swipe of the orange-blossom-flavored wipe will clear red-wine stains from your teeth and mouth—not to mention cleanse the palate.